I get weird looks even if the music isn’t just in my head. 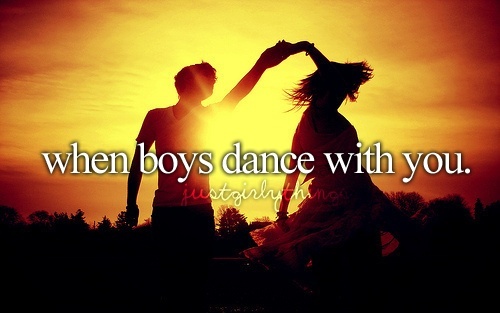 I find that people who don’t dance generally think I’m crazy. The whole “Big Dance”, dancing all night thing might have something to do with that. I’ve never had anyone give me grief for being a dancer, not even in jest really. 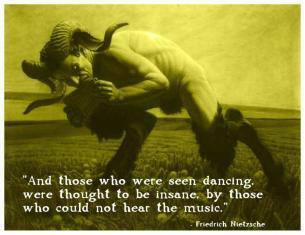 Most people shake their head in awe when I tell them I dance, and that’s about it if I fail to persuade them to join the cult of dancing. As for hearing music that no one else can here, I’m going to wax philosophic here for a minute. I find that one of the best things I got out of dancing is that I stopped caring so much what everyone else thinks of me. I still haven’t shaken the problem completely, but I’m working on it. I have learned that when you find yourself in a situation and have to make a decision, just make it. No one can see the situation from your perspective, not even you after the fact. Make the best decision that you can at the time, and don’t second guess yourself after the fact. It is at best a waste of time and at worst, counterproductive. Do you guys ever have pleasant or unpleasant interactions with non-dancers who think you are crazy?